Shockwave, a revolutionnary treatment option for many common but persistent conditions, is gaining popularity amongst medical professionals. As a non-invasive treatment, it is often a preferred alternative to surgery. To put it simply, shockwave therapy is the application of sound waves using strong energy pulses. This occurs for a short period of time, between 10 and 20 minutes, depending on the condition being treated. These pulses create tiny microscopic bubbles that expand and burst. This process stimulates the cells that are responsible for bone and connective tissue healing. It also stimulates the body’s metabolism and improves blood circulation to the area to regenerate damaged tissues. There are many benefits to choosing shockwave therapy. As mentioned earlier, it is a non-surgical alternative. It is a quick and easy treatment with no side effects and it is most effective as a treatment option for stubborn conditions where other treatments have not helped. Most insurance policies cover it as part of a physiotherapy treatment (check your coverage for physiotherapy). 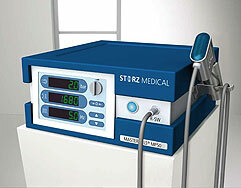 Shockwave accelerates healing, eliminates pain, and restores full mobility in the affected area. And better yet, healing can begin as early as 72 hours after treatment. Gateway Physiotherapy is the only clinic in North Bay that offers this treatment option. If you think that this is a good option for you, please contact the clinic at 705-474-4440.